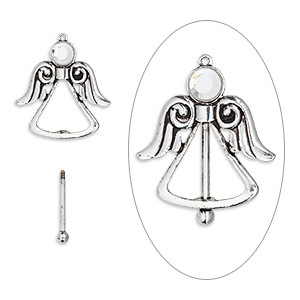 Focal, glass rhinestone with antique silver-finished brass and "pewter" (zinc-based alloy), clear, 44.5mm single-sided angel with twist-off top, 24mm beadable length. Sold individually. 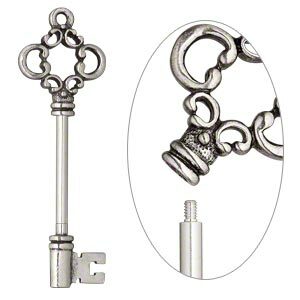 Focal, antique silver-finished "pewter" (zinc-based alloy) and brass, 70x24mm double-sided key with flourish design and twist-off head, 32mm beadable length. Sold individually. 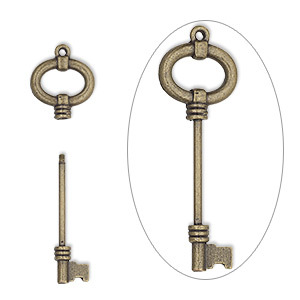 Focal, antique brass-finished brass and "pewter" (zinc-based alloy), 67x24mm single-sided key with open oval with twist-off head, 30mm beadable length. Sold individually. 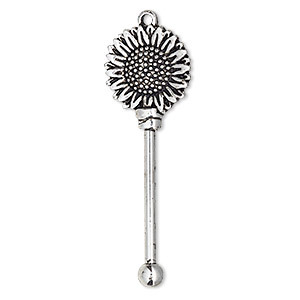 Focal, antique silver-finished brass and "pewter" (zinc-based alloy), 59x20.5mm single-sided sunflower with twist-off head, 30mm beadable length. Sold individually. 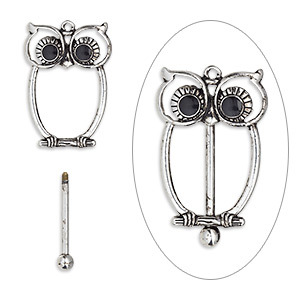 Focal, epoxy with antique silver-finished brass and "pewter" (zinc-based alloy), black, 48.5x30.5mm single-sided owl with twist-off top, 24mm beadable length. Sold individually. 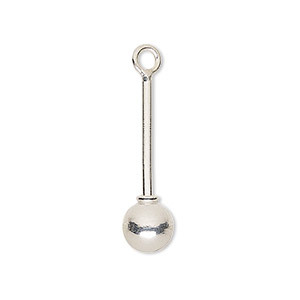 Drop pin, sterling silver, 1 inch with 7mm twist-off ball end, 18mm beadable length. Sold per pkg of 2. 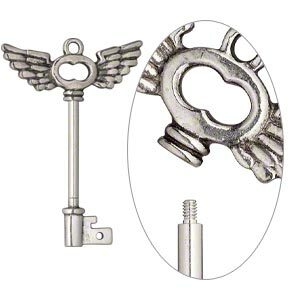 Focal, antique silver-finished "pewter" (zinc-based alloy) and brass, 62x43.5mm double-sided key with wings design and twist-off head, 32mm beadable length. Sold individually. 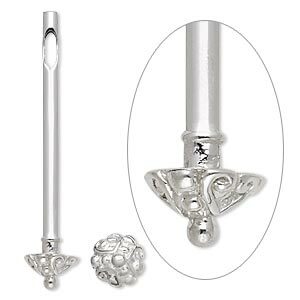 Drop pin, sterling silver, 3/4 inch with 7mm twist-off ball end, 11mm beadable length. Sold per pkg of 2. 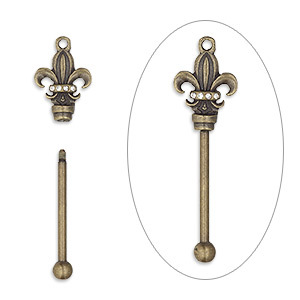 Focal, glass rhinestone with antique brass-finished brass and "pewter" (zinc-based alloy), clear, 55x16.5mm single-sided fleur-de-lis with twist-off head, 30mm beadable length. Sold individually. 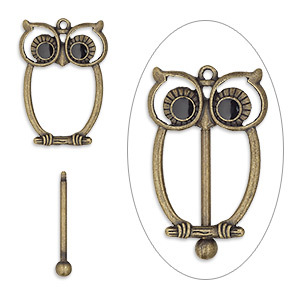 Focal, epoxy with antique brass-finished brass and "pewter" (zinc-based alloy), black, 48.5x30.5mm single-sided owl with twist-off top, 24mm beadable length. Sold individually. 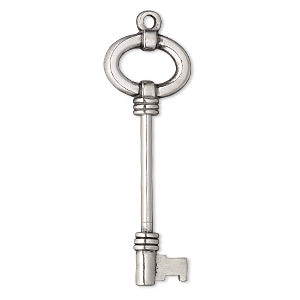 Focal, antique silver-finished "pewter" (zinc-based alloy) and brass, 69x24mm double-sided key with oval design and twist-off head, 32mm beadable length. Sold individually. Focal, glass rhinestone with antique silver-finished brass and "pewter" (zinc-based alloy), clear, 61x16.5mm single-sided key with cutout flower and twist-off head, 30mm beadable length. Sold individually. 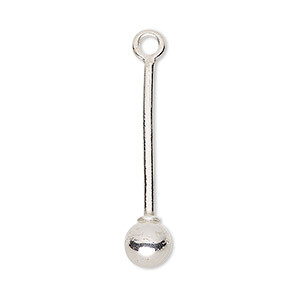 Drop pin, sterling silver, 1-1/2 inches with 7mm twist-off ball end, 28mm beadable length. Sold per pkg of 2. 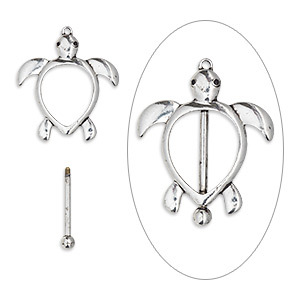 Focal, enamel with antique silver-finished brass and "pewter" (zinc-based alloy), black, 47.5x41.5mm single-sided turtle with twist-off top, 24.5mm beadable length. Sold individually. 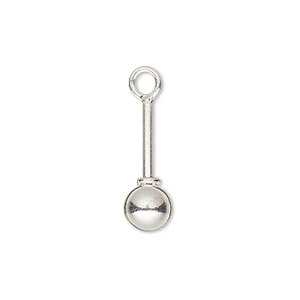 Drop pin, sterling silver, 1-1/4 inches with 7mm twist-off ball end, 20mm beadable length. Sold per pkg of 2. 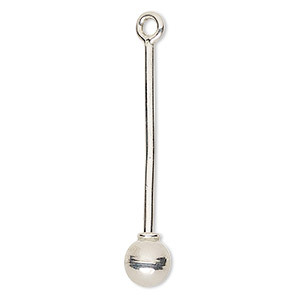 Drop pin, sterling silver, 2 inches with 7mm twist-off ball end, 38mm beadable length. Sold per pkg of 2. 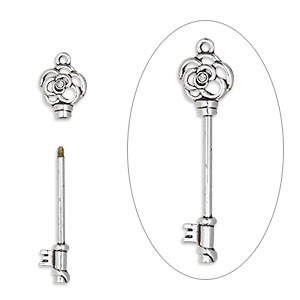 Drop pin, sterling silver, 1-3/4 inches with 7mm twist-off ball end, 34mm beadable length. Sold per pkg of 2. 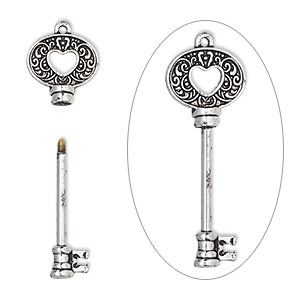 Focal, antique silver-finished brass and "pewter" (zinc-based alloy), 52x19mm single-sided key with oval and cutout heart with swirls design and twist-off head, 25mm beadable length. Sold individually. 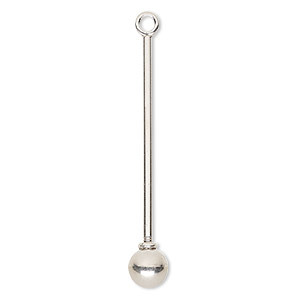 Bead pin, sterling silver, 43x8mm with 38x3mm tube and 8mm round head, fits bead with 3.5mm hole. Sold individually. 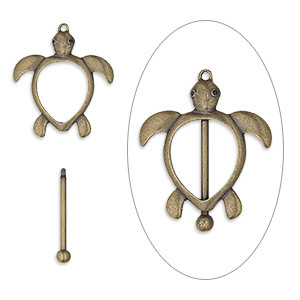 Focal, enamel with antique brass-finished brass and "pewter" (zinc-based alloy), black, 47.5x41.5mm single-sided turtle with twist-off top, 24.5mm beadable length. Sold individually. 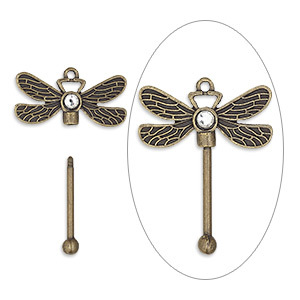 Focal, glass rhinestone with antique brass-finished brass and "pewter" (zinc-based alloy), clear, 48x38.5mm single-sided dragonfly with twist-off top, 24.5mm beadable length. Sold individually. 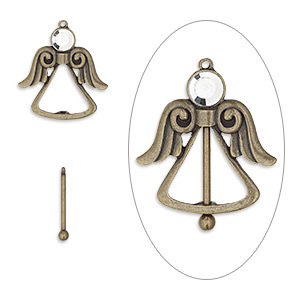 Focal, glass rhinestone with antique brass-finished brass and "pewter" (zinc-based alloy), clear, 44.5mm single-sided angel with twist-off top, 24mm beadable length. Sold individually. 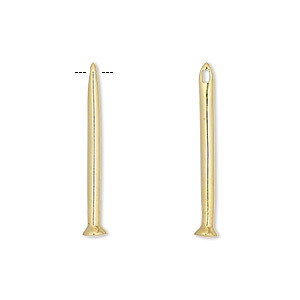 Bead pin, gold-finished sterling silver, 1 inch with 4mm flat base, 19mm beadable length. Sold per pkg of 2. 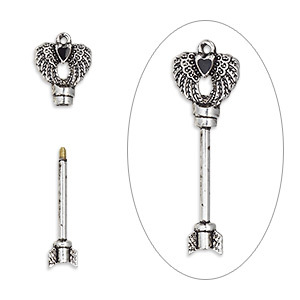 Focal, enamel with antique silver-finished brass and "pewter" (zinc-based alloy), black, 52x18mm with single-sided arrow shaft / wings / heart design and twist-off head, 25mm beadable length. Sold individually.